The Rescan operation might take several minutes to complete. DPM will add any library jobs to the queue that began during the Rescan operation. If a library job is already in progress when the Rescan operation begins, the Rescan operation will fail. – Back up individual files from VM1. – Back up the configuration settings of VM1. – Restore the configuration settings of VM1. – Restore individual files from VM1 to an alternate location. In the event of disaster recovery, System Center Data Protection Manager (DPM) 2010 allows you to recover virtual machines as files to a network folder. You can then copy those files to an alternate Hyper-V host server. However, to start a virtual machine on an alternate Hyper-V host server, you have to manually create and configure the virtual machine using the recovered files. DPM 2010 supports alternate location recovery (ALR), which allows you to recover a Hyper-V virtual machine to an alternate stand-alone Hyper-V host or to a cluster. The recovered virtual machine is already registered and configured on an alternate Hyper-V host server. In a virtualized environment the issue is whether to backup from inside the guest or from the host. The latter provides “bare metal restore” of an entire VM where something’s gone catastrophically wrong with a VM (or the host) but in general it doesn’t provide granular restore of files / folders. DPM 2010 added Item Level Restore (ILR), allowing you to restore individual files or folders within a VM even though it had only been backed up from the host. But this capability was only available when DPM 2010 ran on physical hardware, if the DPM server itself was in a VM this capability was not available. DPM 2012 fixes this glitch and can now do ILR even when the DPM server is a VM. In the VMM console, open the Fabric workspace. On the Home tab, in the Add group, click Add Resources, and then click Update Server. The Add Windows Server Update Services Server dialog box opens. In Computer name, enter the fully qualified domain name (FQDN) of the WSUS server (for example, VMMServer01.contoso.com). Specify which TCP/IP port that the WSUS website listens on for connections (for example, port 8530). Enter credentials for connecting to the WSUS server. The account must have administrator rights on the WSUS server. If necessary, select the Use Secure Socket Layer (SSL) to communicate with the WSUS server and client’s check box. Click Add. The WSUS server will be added to VMM, followed by initial synchronization of the updates catalog. Depending on how many update classifications and products you chose when you installed the WSUS server, this operation can take a long time, depending on such factors as network traffic and the load on the WSUS server. To find out the status of the operation, monitor the status of the Add Update Server and Synchronize Update Server jobs in the Jobs window or in the Jobs workspace. – Approve Windows updates from the VMM Administrator Console. – Store information about Windows update installations in Configuration Manager reports. The requirements need a WSUS server. Server 7 is the most appropriate server to install WSUS. A configuration manager agent is required to store information about Windows update installation in the Configuration Manager reports. 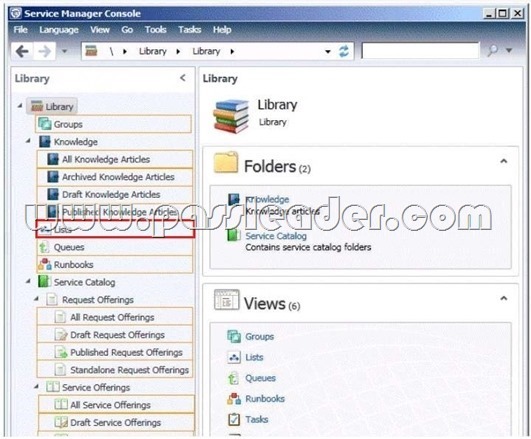 The Default Management Pack file contains common elements such as views at the top level of the Monitoring workspace. 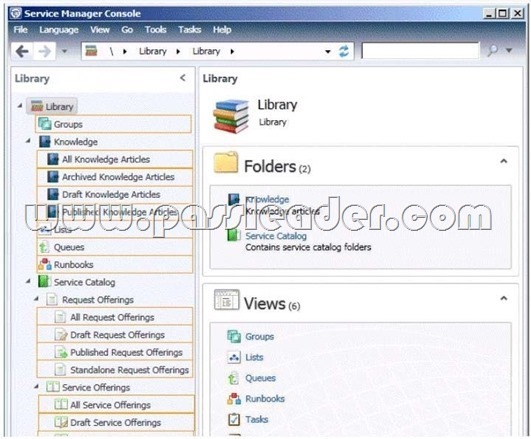 This is an unsealed management pack file so that you can create views and folders at this level. It should not be used for any other purpose. For creating elements such as monitors and rules, create a new management pack file. – View open critical alerts generated by Group1. – Identify whether a monitor generated an alert. Step 1: In an empty dashboard cell, click on the “Click to add widget” link. This opens the New Dashboard and Widget Wizard. Step 3: Once you give your widget a name and a description, you can choose a group or object for which to display alerts. The ability to select between “Groups” and “Groups and objects” allows you to change the scope of objects for which you will receive alerts. If you only want to target a certain object within a group or class, the “Groups and objects” option allows you to do so, while the “Groups” option enables you to view alerts for all objects within the group you choose. Step 4: Next you can specify the criteria for the alerts you will receive. You may choose the Severity, Priority, and Resolution State of the alerts. For example, I will receive alerts for warnings and information of all priority, and in either the new or closed state. Step 5: Lastly, select the columns to display for each alert. You can also decide how the alerts are sorted by default as well as how they are grouped. One great addition to the alert widget that is not present in the alert view is the addition of the “Is Monitor Alert” column. This column allows you to see whether the alert was generated by monitor rather than a rule. In my example, I will group alerts by “Is Monitor Alert” and sort by “Last Modified”. And there you have it. We’ve configured a dashboard with a powerful alert widget. It is a great way to quickly view the alerts you care about organized in the way you want. If you aren’t satisfied with your configuration or if your needs change, you can always click the button which gives you the option to reconfigure, personalize, or remove your widget. Reconfiguring a widget opens a wizard with your previously chosen widget configuration and allows you to change all of options to keep up to date with your needs. Here you can change everything from the groups or objects targeted, to the name of the widget. Personalizing a widget allows you to change the display options for that widget. Here you can change which columns are displayed and how your alerts are grouped and sorted. This allows you to view the alerts within a context that is most appropriate to you, but without having to worry about the primary configuration details. You deploy System Center 2012 Operations Manager. You create two unsealed management packs named MP1 and MP2. You create an override for MP1. You create a group in MP2. You need to apply the override for MP1 to the group in MP2. What should you do before you apply the override? A. Create a new class in MP2. D. Create a new class in MP1. A. From the Service Manager Console, add an incident event workflow. B. From the Service Manager Shell, run the Set-SCDWJobSchedule cmdlet. 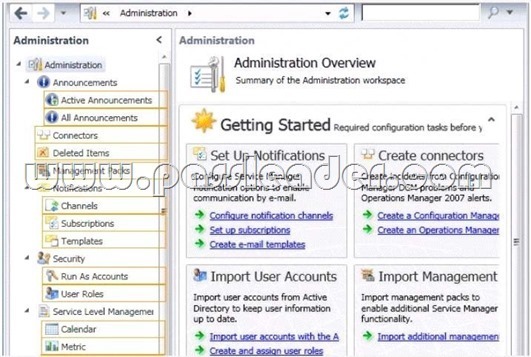 C. From the Orchestrator Deployment Manager, register the Integration Pack for System Center Service Manager. D. From the Service Manager Console, create an Orchestrator connector. E. From the System Center 2012 Orchestrator Runbook designer, create a connection. F. From the Service Manager Shell, run the Enable-SCDWJobSchedule cmdlet. A. Register the Orchestrator Integration Packs. B. Create an Exception Management Workflow. C. Register a data source. D. Select the sync folder for the Orchestrator connector. After importing into Orchestrator and setting up connections, you need to sync from Service Manager (make the run books available). 1. Create Runbook Automated Activity Template. 2. Extend service request class. 3. Create Service Request template using the new Class and include the Runbook Automated Activity Template. 4. Create the Service Request Offering. Your company has a private cloud that contains a System Center 2012 infrastructure. The network contains a Service Manager infrastructure and a Configuration Manager infrastructure. You create a configuration baseline for desired configuration management. You need to ensure that an incident is created automatically in Service Manager when a device is non-compliant. You install the Configuration Manager connector for Service Manager. What should you do next? A. Create a Desired Configuration Management Event Workflow Configuration. B. Create a service level objective (SLO) for the desired configuration management incident. C. Create an incident template. D. Import the Configuration Manager Management Packs. 1. In the Service Manager console, click Administration. 2. In the Administration pane, expand Workflows, and then click Configuration. 3. In the Configuration pane, double-click Desired Configuration Management Event Workflow Configuration. 4. In the Configure Desired Configuration Management Workflows dialog box, click Add. You need to create a self-service request offering that will allow users to provision new virtual machines. On which server should you perform each of the following actions? To answer, select the appropriate server for each action in the answer area. You need to create a distributed application first to be able to create the service level dashboard. First a DA, followed by a service level objective, and finally a Service Level Dashboard. Your company has a datacenter in Los Angeles that contains a System Center 2012 Operations Manager infrastructure. You create three unsealed management packs named Pack1, Pack2, and Pack3. You create an override for Pack1. You create a group in Pack2. You need to apply the override for Pack1 to the group in Pack2. What should you do before you apply the override? Your company has a private cloud that contains a System Center 2012 Service Manager infrastructure. The help desk uses Service Manager to manage and track incidents. Service desk analysts report that they receive many Windows 7-related incidents. You need to create a classification for the Windows 7-related incidents. What should you configure to create the classification? To answer, select the appropriate configuration in the answer area. 5. In the Link to New Parent Incident dialog box, select a template to create the new parent incident with, and then click OK. For example, select Networking Issue Incident Template, and then click OK.
6. In the Title box, type a new description or modify the description that is inserted by the template. For example, type Network Outage in Bldg 773. Your company has a private cloud that is managed by using a System Center 2012 infrastructure. 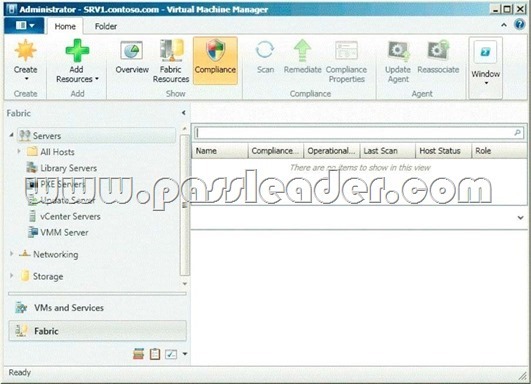 The network contains an Operations Manager infrastructure and a Virtual Machine Manager (VMM) infrastructure. You implement a Microsoft SharePoint Server 2010 farm that is hosted on 10 virtual machines. The company defines a service level agreement (SLA) for the farm’s availability of at least 99.9 percent uptime. You need to ensure that the company’s compliance officer can identify whether the SLA requirement is met. What should you do? Adding only the servers doesn’t mean, that the services (SharePoint) are available. So it must be a distributed application.